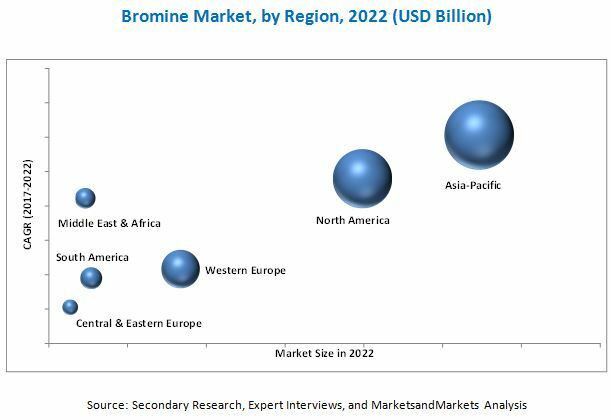 [164 Pages Report] The global bromine market was valued at USD 2.47 billion in 2016 and is projected to reach USD 3.96 billion by 2022, at a CAGR of 8.4% between 2017 and 2022. Bromine is a dense (heavier than air) reddish-brown liquid that evaporates easily at a standard temperature and pressure. It is corrosive, toxic, and has orange colored vapors that possess strong odor resembling that of chlorine. It exists as a diatomic molecule Br2 and belongs to the class of halogens in chemistry. A solution of bromine in water is called “bromine water”, which is used as a test reagent in organic chemistry to identify unsaturated compounds. Bromine and its compounds are used as a catalyst in many chemical processes including drug formulations. In this study, 2016 has been considered the base year and 2022 the forecast year to estimate the market size of bromine. Many companies are extensively using bromine to mitigate mercury emissions at coal fired power plants. In these plants, mercury is released when coal is burned taking three forms of the flue gas- elemental, oxidized, and particulate. Bromine compounds bond with mercury in flue gases, creating mercuric bromide, a substance that is more easily captured in flue-gas scrubbers than the mercuric chloride that is produced at many facilities. Therefore, chemical additives have been developed to oxidize the mercury in the flue gas, converting it to a form, which can be captured by the current abatement equipment. Calcium bromide (CaBr2) is one of the chemical additives that have been developed as a mercury-specific control technology. CaBr2 is effective in reducing total mercury emissions by oxidizing mercury that is then captured by the abatement equipment. Thus, the extensive use of bromine salts (for instance, CaBr2) in mercury mitigation drives the bromine market, globally. Studies show that these emissions amount for about half of the total mercury emissions in the air. The coal plants eject mercury in the form of methyl mercury. Methyl mercury is a toxic form of mercury affecting the nervous, immune, and enzyme systems. A developing fetus is five to ten times more sensitive to methyl mercury than an adult. Therefore, women who consume large quantities of contaminated fish give birth to children with neurological disorders, for instance, learning disabilities. Different secondary sources, such as company websites, encyclopedia, directories, and databases such as Hoovers, Bloomberg, Businessweek, Factiva, and OneSource have been used to identify and collect information useful for this extensive, commercial study of the global bromine market. Primary sources, including experts from related industries, have been interviewed to verify and collect critical information and assess prospects of the market. The top-down approach has been implemented to validate the market size in terms of value. With the data triangulation procedure and validation of data through primaries, the exact values of the overall parent market size and individual market sizes have been determined and confirmed in this study. 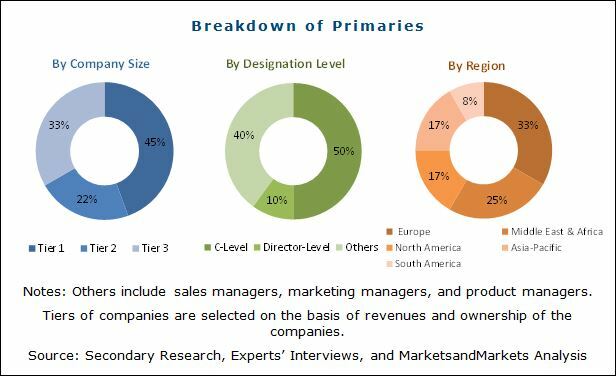 The bromine market has a diversified and established ecosystem of upstream players, such as raw material suppliers, and downstream stakeholders, such as manufacturers, vendors, end users, and government organizations. The key manufacturers of bromine include Israel Chemicals Limited (Israel), Albemarle Corporation (US), Chemtura Corporation (US), Tosoh Corporation (Japan), Tata Chemicals Ltd (India), Gulf Resources Inc. (China), TETRA Technologies, Inc. (US), Hindustan Salts Limited (India), Honeywell International Inc. (US) and Perekop bromine (Republic of Crimea). In January 2017, Israel Chemicals Limited (Israel) and The Institute of Chemistry, Hebrew University of Jerusalem, Israel developed a unique bromine-based perovskites material for use in the next generation photovoltaic cells. They offer superior cost/performance ratio compared with silico-based photovoltaic and are rapidly developing as a viable industrial alternative. Unlike the common iodide-based perovskites, the bromide-based perovskites offer specific advantages such as record power conversion efficiency, high open circuit voltage, and high stability. In February 2016, Albemarle (US) and ICL (Israel) entered into a long-term supply agreement for sustainable polymeric flame retardants. This agreement will facilitate the supply of GreenCrest, a sustainable flame retardant alternative to hexabromocyclododecane (HBCD)-based flame retardants, on a commercial scale. This benefited the customers and helped companies broaden their product portfolio. In April 2017, LANXESS (Germany) acquired Chemtura (U.S.), one of the world’s leading suppliers of flame retardant and lubricant additives. The acquisition helped the company expand its additives portfolio to make it one of the world’s leading players in the specialty chemicals industry. The acquisition also helped the company increase its footprint in the North American region. What are new application areas which the bromine companies are exploring? The global bromine market is projected to reach USD 3.96 billion by 2022, at a CAGR of 8.4% between 2017 and 2022. By volume, it is projected to reach 716.18 kilotons by 2022. The growing use of bromine in mercury mitigation, increasing demand for flame retardants due to stringent fire safety standards and extensive consumption of bromine in diverse applications are the key factors driving the global bromine market. On the basis of derivative, the global bromine market has been classified into organobromines, clear brine fluids, and hydrogen bromide. Organobromine was the largest segment of the global bromine market, by derivative in 2016. Organobromine is used extensively in the flame retardants and in fumigant synthesis. Drugs containing organobromines are used for treating pneumonia and cocaine addiction. Thus, the extensive consumption of organobromine in flame retardants, fumigants, and drug formulations makes it the largest derivative of bromine used in the world. On the basis of region, the global bromine market has been segmented into Asia-Pacific, Western Europe, Central & Eastern Europe, North America, the Middle East & Africa, and South America. The Asia Pacific region led the global bromine market, in terms of both, value and volume, in 2016. China is the largest market for bromine in the Asia Pacific region, and accounted for a major share in terms of value, in 2016. The growing demand for flame retardants for the automotive industry and insulation applications, easy availability of raw material and consumers, and increasing number of new production facilities to meet the growing demand for bromine are the key growth drivers in the bromine market in this region. Oil & gas is the fastest-growing application of bromine. Clear brine fluids, which is one of the major derivatives of bromine is extensively consumed in the oil & gas application. They are the saline liquids that are used in various oil & gas well drilling operations. Clear brine fluids are also used in the groundwork of a penetrating bore well hole for oil & gas drilling. These fluids are specially manufactured to control formation pressure as well as diminish damage in the reservoir. Clear brine fluids are categorized into potassium chloride, calcium chloride, sodium chloride, calcium bromide, potassium bromide, sodium bromide, and others (including zinc bromide and ammonium chloride). Potassium bromide and chloride fluids find application in examining wells in the oil & gas industry. Calcium chloride brines are one of the most cost-effective brines used in oil field completion and workover maneuvers. Clear brines are used as completion and drilling fluids by the upstream oil & gas industry and are supplied mainly by Israel Chemical Ltd (Israel) to the major service companies. Plasma etching is one of the important applications of bromine due to its increasing significance in the electronic industry. In the semiconductor industry, hydrogen bromide is used in plasma etching of polysilicon. Plasma etching is a technique of etching or gasifying substrate material in plasma. It is a type of dry etching process as it involves dry agents such as reacting gas (plasma) and volatile products. HBr is used principally to etch silicon. Usually, it is used alongside chlorine and oxygen. HBr transforms both the plasma and surface chemistries of the process, which, in turn, alters etch performance. Adding HBr makes the profile more anisotropic, in contrast when chlorine is used separately. The oxygen is added to the mixture to remove organic compounds. The inclusion of HBr in the plasma gas mixture results in a better-quality etches profile. There is less undercut, more vertical sidewalls, and flatter trench bottoms. This process of plasma etching is done to fabricate integrated circuits. The use of bromine to mitigate mercury emissions at coal fired power plants is increasing due to hazardous effects caused by mercuric chloride emission. Brominated compounds are used to bond with mercury in flue gases from coal-fired power plants creating mercuric bromide, a substance that is more easily captured in flue-gas scrubbers than the mercuric chloride that is produced. The application of bromine compounds to neutralize mercury emissions seems to be more cost-efficient in comparison to that of other materials such as chlorine, fluorine, or iodine-based compounds. The extensive use of bromine-based technologies for the removal mercury emission at coal-fired power plants is driving the growth of bromine market, globally. What are the upcoming industry applications for bromine? The global bromine market is witnessing moderate growth. Factors restraining and challenging the growth of the bromine market are the significant decrease in oil & gas prices in the past years, emergence of non-halogenated flame retardants, and toxicological effects of brominated compounds. Israel Chemicals Limited (Israel), Albemarle Corporation (US), Chemtura Corporation (US), Tosoh Corporation (Japan) and Gulf Resources Inc. (China) led the global bromine market. These players are consolidating the market through mergers & acquisitions, agreements and are launching new products which will help them strengthen their positions in the global bromine market. 11.6 Shandong Yuyuan Group Co., Ltd.
11.7 Shandong Haiwang Chemical Co., Ltd.
11.8 Shandong Haihua Group Co., Ltd.
11.9 Shandong Ocean Chemical Co., Ltd.
11.10 Shandong Weifang Longwei Industrial Co., Ltd.
11.11 Shandong Runke Chemical Engineering Co., Ltd.
11.13 Shandong Lubei Chemical Co., Ltd.